Like the Davy Crockett who in his own autobiography describes his family as of Ireland and IRISH! not scots anything what so ever, no mention what so ever! should come as no surprise when their whole basis is founded in a myth. so have these bigots for political racist and sectarian reasons just claimed Elvis. But no more, no surrender to their ignorant MYTHS! These ignorant racist more british than the british imbeciles must think no one will actuallycheck their claims! An 18th-century court document, proving Elvis Presley’s Irish ties, shows that his ancestor fled Leinster’s mean streets “in great dread” for a quieter life in America. The document, from 1775, which will be auctioned in a Dublin saleroom on May 14th, concerns legal proceedings brought by William Presley, the singer’s great-great-great-great-grandfather. Originally from the townland of Stranakelly near Shillelagh, Co Wicklow, Presley, a farmer, claimed he had been savagely assaulted by a group of men in Hacketstown, in neighbouring Co Carlow. In Carlow Court of Assizes on August 25th, 1775, he claimed that he had been “violently insulted, assaulted, beat and abused” by a group of Wicklow men. He said the men had used their “whips and fists, dragged him down by the legs”, and when down, gave him “several kicks in his body and face”, all “without any provocation”. The men were “swearing they would have his life”, he told the magistrate. Presley said he was now in “great dread and fear of his life”. The magistrate agreed to list the case for a further hearing. It is not known what happened next in the court, but Presley emigrated to the US later that year - with his son Andrew - and first settled in New Orleans. The document is in Whyte’s Auctioneers Eclectic Collector sale on May 14th and has an estimate of €500-700. Three years ago, genealogists discovered Elvis Presley’s link to William Presley. According to the catalogue notes, William Presley later moved to Tennessee, where he died in 1802. Presumably on the basis of the surname Presley. 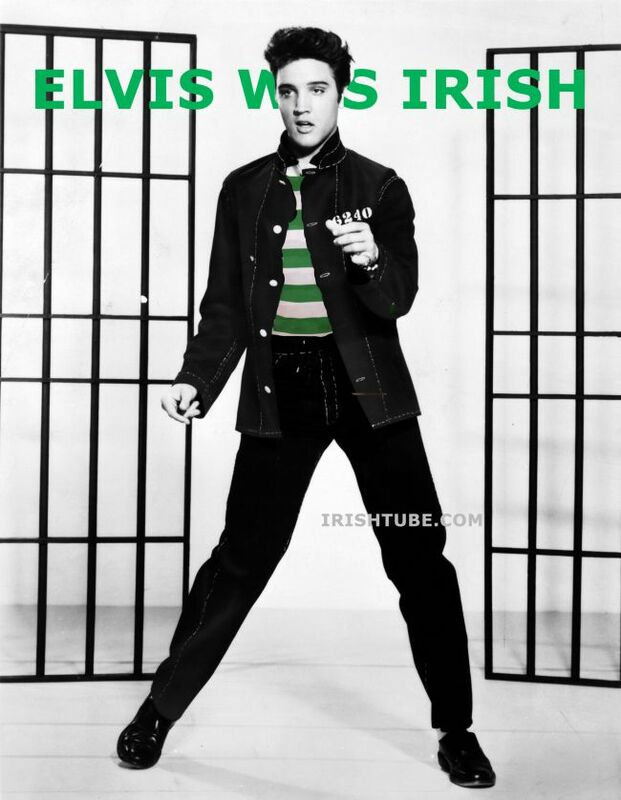 Elvis Irish ancestors did not even live in Ulster! Are these brits that ignorant? or just selectively ignorant? IRISH NAMES WERE ALL ANGLICISED, changed by proscribed laws that encouraged via the English law / terrorist sword the outlawing of all MAC AND O' names. So Mac Gabhann became MacGowan became and then when the penal laws and anglicisers got to work became Smyth or Gow or Gowan or Cowan or a number of variants - almost anything but the Irish original. The orange and BNP brit (same thing) like to quote Gerry Adams as must have been English because of his surname. Wrong you selectively ignorant racist bigots! Adams in Ireland (0r where ever there descendants emigrated) is Anglicized from Irish original, when in Ulster and Louth etc. Ir. Mac Adaim, Mac Ádhaimh (early). More general as Adams. The Barrys of Cork adopted the patronymic Mac Adaim at one stage. In Armagh it may be a corruption of Mac Cadáin (Mac Cadden). As for the first famous Elvis he was a Irish saint!